PPE Personal Protective Equipment for arc flash protection is the last line of defence to be used to protect the worker from injury. Personal protective equipment selection is a very complicated and complexed task. Personal protective equipment should be selected based on the recommendations outlined in the CSA Z462 Clause 4.3.5 Arc Flash Hazard Analysis. Method 1, selection based on the amount of incident energy exposure a worker will be exposed to while performing a specific task on an electrical system that is energized. Method 2, selection based on hazard risk categories. 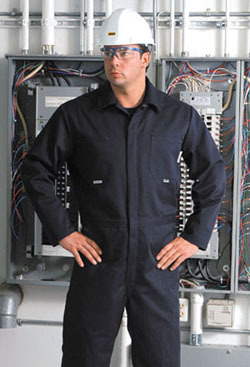 In all cases, de-energizing the system prior to performing work is the preferred method of protection for workers. The incident energy values of an electrical system are displayed on equipment labels and are a result of a detailed arc flash hazard analysis. A&E Training and Technical Solutions can provide you with a turnkey analysis and report of our findings including labeling the equipment accordingly. We can also assist you and your staff in performing this analysis in house. If you have not completed an arc flash hazard analysis you can still select the appropriate PPE using Table 4 of the CSA Z462 This is a task based matrix table that will assist you in selection of PPE (personal protective equipment) based on the task to be performed. Make sure that you read and understand the limitation of the tables and that the equipment you are to perform the task on falls within the limitations. A&E Training Services can assist you in developing a personal protective equipment safety program for all of your service technicians based on the values of energy present in your facilities electrical system. Contact us when you are ready to advance your organization safety programs and plans. Our technical advisors and safety specialists will provide the necessary consultations to ensure a smooth and effective transition.